This page was created by Brittney Smith, a senior English major at UCSB (link to author page). I have always loved Classic Hollywood films and thus I knew a great deal about Marlene's filmography before this course. However, I would never have guessed how closely linked she might have been to the Nazis and Hitler himself had she not been such a strong-minded woman who refused to participate in their political games. My information came from various Internet sources (sources). One cannot speak of Marlene Dietrich without thinking of personality. She had brains, beauty, and most of all, power - something most women of her era found hard to tackle. Born in Germany in 1901, she became a much beloved actress in Nazi-Germany, but never did she feel this a goal. Unlike most, she despised all that the Nazi Party stood for and refused to become the iconic entertainer for their regime. After winning the leading role of "Lola Lola" in Josef von Sternberg's Der Blaue Engel (The Blue Angel), her work in Germany ended by choice, and on the day of the film's premiere in 1930, she fled for the United States. Upon her arrival in America, Dietrich performed for Allied troops and was often heard referring to Hitler as "an idiot." She was an anomaly for her time by defying all that the Nazis stood for. Life could have been made very easy for Marlene if she had followed orders and become the star that Hitler and Goebbels wished she would. Though she was famous in Germany before her departure, she became much more infamous for defying their ideals. Her beauty was quintessential of the aimed for Aryan features, but by sticking to her own beliefs and morals, she showed everyone that she was much more than "a pretty face" and did not simply stand by and watch Hitler destroy the world. Her strong opposition against the Nazi powers were rewarded in 1947 by receiving the U.S. War Department's 'Medal of Freedom' for entertaining troops throughout World War II and also for her strong stance against Nazism. Thirty years after leaving her homeland, Dietrich paid a visit to Berlin and was received by an angry group of picketers urging her to "go home." Despite this negative homecoming, President Rau welcomed her back "stressing her commitment to 'democracy and freedom' during the Nazi era, while Chancellor Gerhard Schroeder said she was 'Germany's first international star'" (http://news.bbc.co.uk/1/hi/entertainment/film/1730078.stm). Though these comments given by German political figures showed the government's change of leadership, the public's views were less positive and thus exemplified the common feelings of a country torn between Old and New World opinions. "Ten years after her death, Berlin - the city of Dietrich's birth which she shunned for most of her life - declared her an honorary citizen. On April 18, 2002, the city's legislature bestowed honor on her as 'an ambassador for a democratic, freedom-loving and humane Germany.' The declaration hoped this "would symbolize the city of Berlin's reconciliation with her'" (http://imdb.com/name/nm0000017/bio). 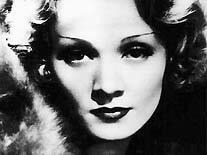 Though frequently cast as a woman of low moral fiber, Dietrich put her heart into what she felt strong enough about. Her life choices were often scandalous and paved with rebellion; her numerous affairs were often news, especially since through them all she was married to the same man (Rudolf Sieber) from 1924 until his death in 1976. Still, she was the poster-girl of feminism and played a great role in paving the way for female equality among men in spite of the media's attention. She was the opposite of Hitler's ideal woman because she was her own person. She made her decisions based on her own opinions and ideals, not someone else's. Hitler may have loved her once for her beauty and ability, but Marlene was never the kind of woman he needed her to represent, nor would she become one. She once said that "I am at heart, a gentleman," and her actions throughout life proved this to be so.